I would like to share with this fine community my most recent scabbard that I completed. 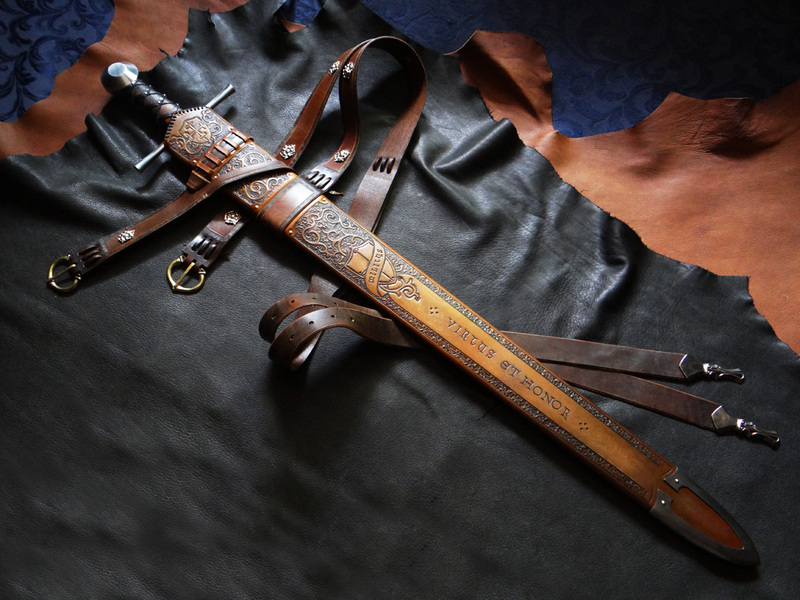 This one is a highly embellished scabbard with lots of tooling, décor, and lightly aged. I used a slightly different technique in my two-toning for a high contrast effect to really enhance the details. 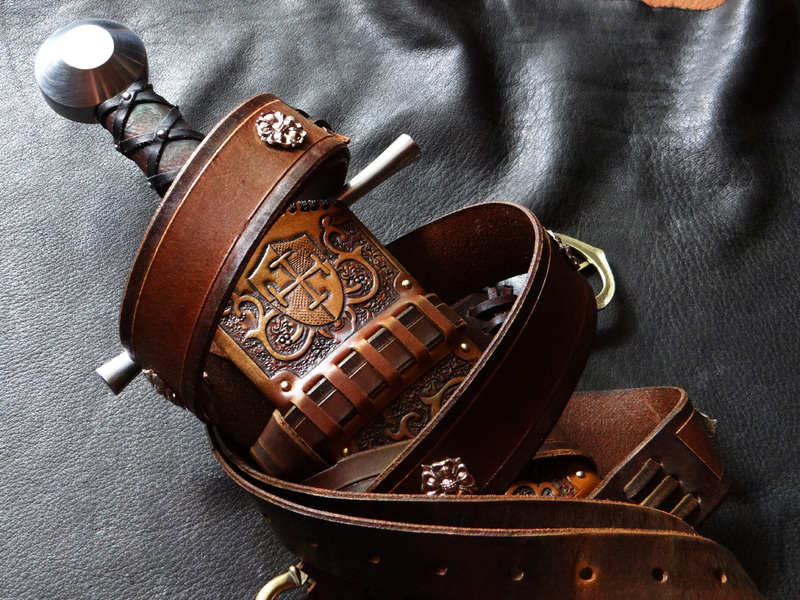 The scabbard features a double-belt suspension system for a right-handed swordsman. The poplar wood core is wool lined and lacquer coated on the outside to help protect against moisture. attention eventually ... and how can your work not come to mind ? pairs -- for efficiency ( not necessarily speed's ) sake ? about " here that you haven't had the chance to ? Thanks Matthew. I generally only work on one scabbard at a time, as this allows me to concentrate on it a lot better. I've tried multiple scabbards at one time, and though there are some elements that benefit from making more than one, there are plenty of other elements that double your time and often my days are a lot longer. But design intense projects are much better off one at a time, especially because tooling can be a real strain on your hands. Tracking time is of another issue, as sometimes the design process is the most difficult, as there are plenty of paper wads thrown into the garbage before you come up with something you like. There are plenty of lost hours in that process, too. The leather finishing is very intense as well, and is probably the second most time consuming aspect. I don't track my time of actual construction of the scabbard and construction of the leather & harness, as those are set prices. My most detailed projects I'd say would be anywhere from 30 to 40 hours. Edit: I should add that those hours don't include the making of the chape, which is a vastly undercharged aspect of scabbard making when you consider the hours making something out of metal by hand. I am continually in awe of the scabbards and suspension systems you are creating Brian. Makes me wish that I had a sword that was in need of something from you! Seeing your work makes me proud to have the pleasure to work with you on the two that I have. I wonder if my daughters would understand not going to college so I can get a sword for you to make a new setup for me? Should invest in a doghouse first I suspect. Brian - another outstanding work of art. You never fail to impress!! Brian, that tooling is really attractive. It's sort of insane how much detail you put in there. Nice job. Oh man, you really went all out on that one! I gotta get my Albion Knight to you for a scabbard. My God, it looks like a wealthy noble just came in from campaign and shucked out of his sword belt to have dinner. It really evokes a sense of history being a living thing. It's stunning. That cross hatching is tiny! Incredible. I'm not sure how you keep upping your game, but you do. Did you also do the grip work? Thanks everyone! Keith, the grip is the upgraded grip from Albion. The tooling on the scabbard is really outstanding. I love this kind of work and we don't see enough of it in modern reproductions, really cool. Thanks Patrick. It has become my forte within the business of scabbard making, and I'm happy to do so as it allows for constant creativity. Deposit paid, I'm in line for my DBK scabbard! I have a different viewpoint. I find the scabbard to be overwrought. A more elegant, simplified approach would best serve the detail in the sword grip. Stunning ! Glad I'm on the waiting list for a scabbard.